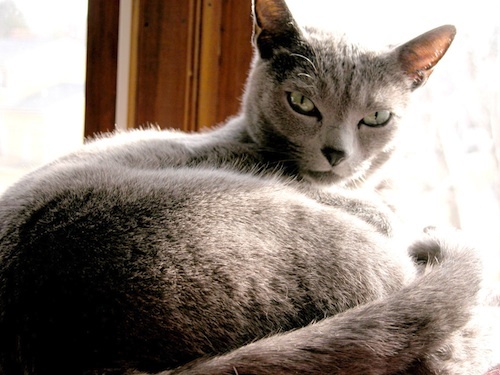 My Russian Blue prince, Yuri, taught me so much about urinary problems in cats. Urinary problems seem to be reaching epic proportions. They are one of the most frustrating medical problems a cat parent encounters. Often there are multiple episodes that result in surgery and/or a substandard prescription diet. The problem may be accompanied by out-of-litter box behaviors that linger long after the physical problem is addressed. Even though he was fed a raw diet since kittenhood, Yuri had intermittent urinary problems. He was wound a bit tight, which may have been part of the problem. My veterinarian thought it may have been anatomical; the narrow urethra of males make them vulnerable. I have a thick folder of research and had a cupboard of supplements. He would go for months without a problem, then have a flare-up and/or blockage. There are many causes and many ways of managing the problem, so it’s important to learn the triggers and choose treatments (including supplements and nutrition) that best meet your cat’s needs; don’t neglect proper diagnostic tools as a starting point. These resources can provide you with a starting point for understanding the disease and its variations. They can also help in discussing the problem with your veterinarian. Remember, if your cat is showing signs of a blockage – going back and forth to the litter box yet producing small amounts of urine (that may be blood-tinged) – you need to get him to the vet’s quickly. It’s a potentially life-threatening situation. If you have any additional links, feel free to share them. Even die-hard raw feeders can run into problems. This Cat Nutrition blogpost shows just how tricky urinary problems can be. An interesting article by Sarah Wooten, DVM, that takes into account the emotional make-up of the cat – Feline interstitial cystitis: It’s not about the bladder. An integrative overview of inappropriate litter box behavior from the IVC Journal. A good starting point for examining at the problem. The Winn Feline Foundation has many articles on all aspects of urinary problems, including this one, Clues to the Mystery of Feline Idiopathic Cystitis. A general search at Winn also provides a lot of information. How I approach… Cats with lower urinary tract signs. A detailed article by Dr. Jodi Westropp with case histories. From the same author as above with Dr. Tony Buffington: FIC: Current Understanding of Pathophysiology and Management. More from Dr. Westtropp: Risk factors in feline lower urinary disease. From Catster: What Can Be Done for a Cat with Chronic Bladder Problems? 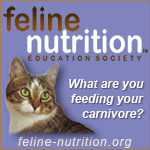 Feeding for Urinary and Kidney Health by Elisa Katz, DVM, as published in Feline Nutrition. Urinary problems go hand in paw with out of litter box behavior. Here an article by Laurie Goldstein, How to Remove Cat Urine.